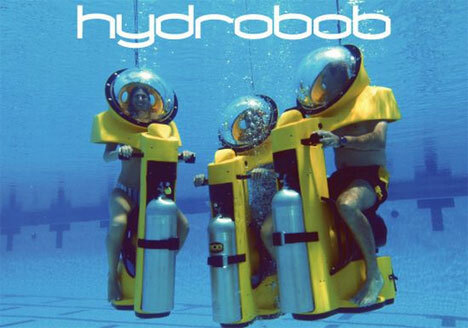 For people who have never learned to swim but long to feel the rush of exploring underwater, HydroBOB offers a unique aquatic experience. Described as an “underwater scooter,” the little contraption lets anyone dive in fresh water without scuba lessons or even learning to doggy paddle. The HydroBOB helmet lets users breathe normally and see all around them underwater. Riding the strange scooter requires no physical exertion at all; you hop on and pull a trigger to make it carry you around to explore the underwater environment. 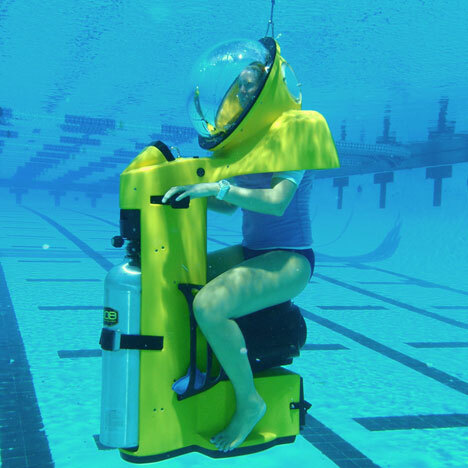 Unfortunately, it looks like the HydroBOB can only be used in swimming pools, which sort of negates the exploration aspect of an underwater scooter. But the company that offers HydroBOB rides operates a school of robotic fish for users to interact with, so there is more to do underwater than searching for lost nose plugs. See more in Mods & Custom or under Transportation. April, 2011.